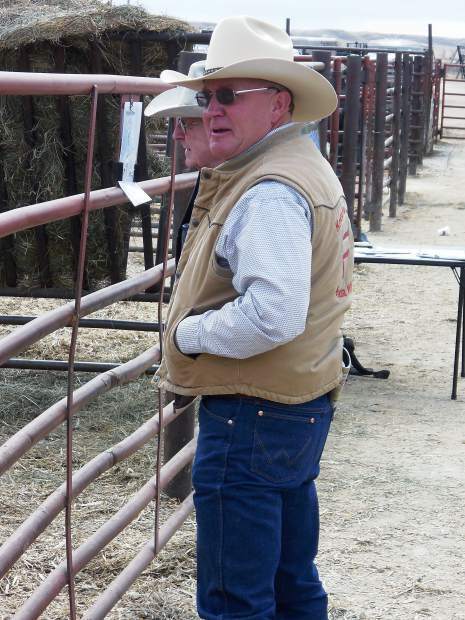 There was a barrage of classy bulls offered at the 7th Annual Cowboy Classic Bull Sale. After meeting all of the consignors; Pete and Lucy Widener, Sheridan, Wyoming, David and Diana Oedekoven, Sheridan, Wyoming, Kelby and Lacey Kretschman, Arvada, Wyoming, and Andy and Sarah Swenson, Ballantine, Montana, it was easy to see that they were all quality people that were proud of their individual product. It's refreshing to talk to down to earth people that were totally transparent about their bulls. Full disclosure was at the forefront, with the long term wellbeing of the consumer in mind. The combined offering brought 81 bulls to town with an additional assortment of 38 total females. 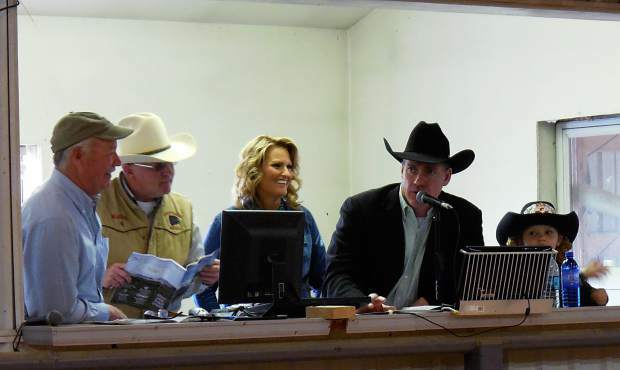 The top selling bull was Swenson Cattle Company's Lot #85 ringing the bell at $9,000. This deep bodied smooth moving bull went to Jim Purdy of Buffalo, Wyoming. Lot #85's EPD's were; CED +14, BW -1.5, WW+49, YW +84, MILK +27, ACT. BW 65 pounds, and a 205 weight of 832. Lot #39 of Double W Angus (Pete and Lucy Widener) sold for $8,000 also going to Jim Purdy, Buffalo, Wyoming. With a CED of +16, a BW EPD of -3.1, and ACT. BW of 71, this was a calving ease deluxe bull with decent gains to go with him. Lot #87 of Swenson Cattle Company brought $7,750. This was a long rib, big shouldered calf with a $W of +49.70, WW of +52, YW of +93, and 205 WT of 813. A definite top pick of the pen that went to Glen Rowen in Worden, Montana. Ringing the bell at $7,000 was Lot #98, 84, and Lot #66. Lot #98, consigned by Oar Angus (David and Diana Oedekoven), and bought by Bobby Arndt of Arvada, Wyoming was an Embryo Transfer calf out of Sitz Traveler 8180 Sire, and Oar Lead On Georgina 0501 Dam. He had a WW +43 and YW +79. Lot #84 consigned by Swenson Cattle Co. was the easy fleshing kind with a 205 WT. of 833. He had the classic Angus look from head to tail, the herd bull type in and out! He went home with the Lehrkamp family of Caputa, South Dakota. Lot #66 also bringing $7,000 and consigned by the Double W Ranch. This too was an Embryo Transfer calf, bought by the Diamond Cross Ranch. This was a bull with outstanding conformation and the following EPD's; BW +1.5, WW +49, YW +83, MILK +23, and $W of +45.49. Kelby and Lacey Kretschman offered 15 top commercial heifers that averaged $1,100 per head. 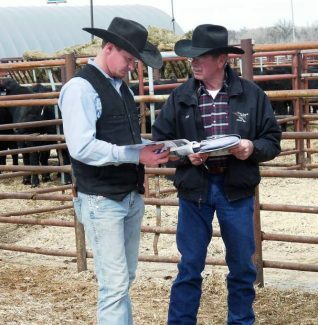 Hats off to all of the consignors of the Cowboy Classic Angus Bull Sale. They brought a quality product to town and put on a great sale!